You're planning to hit Los Angeles for the weekend of Decibel Metal & Beer Fest: LA, right? Of course, there is nothing to do in Los Angeles on a Friday night, so we've got you covered before the main event begins on Saturday. 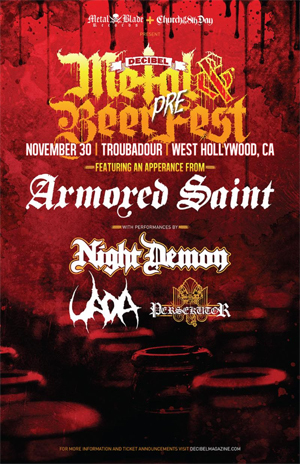 Get your pre-game started at the legendary Troubadour with the official Decibel Metal And Beer Fest: Los Angeles PRE-FEST, exclusively presented by Metal Blade Records and Church of the 8th Day! On Friday, November 30th, black metal enigmas PERSEKUTOR, melodic black/death titans UADA, California triad metal torchbearers NIGHT DEMON support a special appearance from old-school heavy metal heroes ARMORED SAINT! Tickets are just $25 and are on sale at the Church of the 8th Day site HERE. Note: Pre-Fest tickets are NOT included with the purchase of Decibel Metal & Beer Fest: Los Angeles tickets.